It was created on May 10, 1999 for the personal enjoyment of Southern Miss fans everywhere. No visit to Southern Miss and "The Rock" would be complete without a stroll through Eagle Walk. 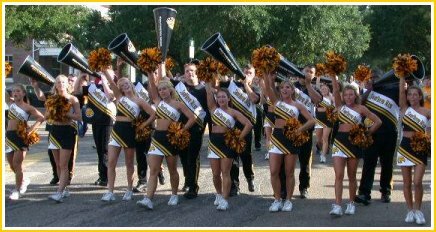 Here one can walk among the memories of greatness captured and permanently displayed in a forum designed to promote the rich tradition and memorable accomplishments of Southern Miss Football. 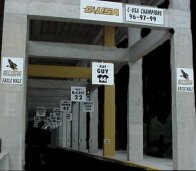 Eagle Walk is located under the east side of M. M. Roberts Stadium. 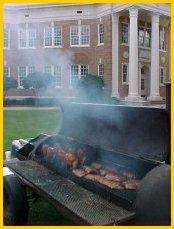 No Southern Miss Saturday would be complete without a day of tailgating activities. When it comes to tailgating, our fans know to come early and stay late. The pre-game sights and sounds begin early...as the tailgaters arrive and claim their turf. Soon the aroma of bar-b-que permiates the area. Laughter and live music soon follow as the tension builds towards kick-off. This tradition grows more each year. 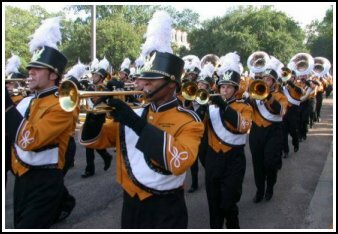 The event is a procession of the ROTC cannon, The Pride of Mississippi Marching Band, Dixie Darlings, Southern Miss Cheerleaders, and our Golden Eagle Football team. The procession starts at the front of the campus, joins the team near the Hub Bookstore, and proceeds through the Eagle Walk "Stadium Drive". The event takes place two hours before kickoff as the team heads to the locker room to make its final preparations for the game. Created and Submitted by "Seismo"